Mechanical safes which incorporate simple keypads or dials long ruled the roost till electronic safes took over and created their own niche market. A manual safe does tend to be user friendly but in today's world of expensive electronic gadgets, not to mention expert thieves, one does need a more secure system. The benefits of an electronic safe should not be overlooked, despite the fact of the possibility of having a shorter lifespan than a mechanical safe if the batteries wear out quickly. An electronic safe is far quicker to open - a useful functionality when you need to access something inside it very quickly. Godrej has come up with some unique electronic safes especially for your computing devices and valuables. Insurance for expensive gadgets and fancy sports watches is all very well, but why not keep them really secure in the first place with these handy safes?! The Godrej E-laptop is a cuboidal electronic steel safe which can house a laptop up to 17 inches. The floor of the safe has soft padding, like a carpet. It even has a charging point within. Nice! 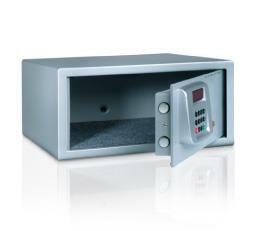 Equally good is the internal LED light so that you can clearly see the interior of the safe. 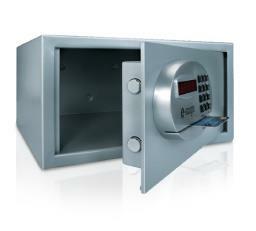 You open the safe via a push button keypad, using a password of 3 to 6 digits. The password entry can be hidden for security purposes. In case on three consecutive tries the password entered is incorrect, then there is an automatic freeze. In the event that the safe's battery gets to a low point, the in-built technological memory assures that the password is not erased. The Godrej E-Bio safe is the type you see in movies, incorporating fingerprint technology for better security of your valuables. That is, you fingerprint is captured with optical technology and stored for authentic access. The advantage of the fingerprint access is that it is quicker than punching in numbers on the keypad. The optics storage can pack in up to 30 fingerprint templates. An auto freeze mechanism kicks in after repeated failed attempts to open the safe. There is also a mechanical override option in case you forget the password. On the inside of the safe you have a soft flooring to ensure jewellery and other valuables such as silver salvers do not get scratches. 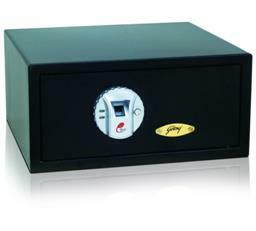 Yet another unique electronic safe from Godrej is the E-Swipe. Its uniqueness lies in the fact that you can access and lock the safe with a credit card or a debit card via the magnetic strip reader. It thus gives maximum security. You do have the option of opening the safe only with a secret password of three to six digits instead of using both the password and the credit or debit card. The push-button keypad is not some delicate structure, but is a heavy duty one. Like the other safes, consecutive wrong attempts to open the E-Swipe results in an auto freeze as well as a mechanical override feature in case the password is forgotten. There are also motorised shooting bolts in the safe's structure and an interior carpet. An indicator will alert you to the battery going low.